Our #1 enzyme product. Clears out old dead proteins from the body. Clears arteries. Removes fibrosis. Relieves auto-immune disorders. Enzymes promote chemical reactions and cellular repair and growth. They work in all areas & systems of the body. Enzymes promote chemical reactions and cellular repair and growth. They work in all areas & systems of the body. Multi-Enzyme Protect contains ingredients that may dissolve blood clots. This is normally beneficial but DO NOT TAKE if you suffer from a blood disorder that affects the ability of the blood to clot or have had a stroke that resulted in inter-cranial bleeding in the last 6 months. DO NOT TAKE during the first 6 months of pregnancy. To aid with the digestion of food take with meals. To obtain all of the therapeutic benefits take on an empty stomach at least twice a day. Maintenance use: 1-2 capsules with each meal. Intensive use: 2 capsules with each meal and 2 capsules twice daily on an empty stomach. Multi-Enzyme Protect contains ingredients that may dissolve blood clots. This is normally beneficial but DO NOT TAKE if you suffer from a blood disorder that affects the ability of the blood to clot or have had a stroke that resulted in inter-cranial bleeding in the last 6 months. DO NOT TAKE during the first 6 months of pregnancy. Life could not exist without enzymes as they promote chemical reaction, cellular repair and growth. There have to date been over 2,700 enzymes that have been identified but many more remain to be discovered; they work in all areas and systems of the body. One of the most important functions of vitamins and minerals is to provide co-enzymes; these in turn are the building blocks of enzymes. Often the symptoms of vitamin or mineral deficiency can be understood as enzyme deficiency. Please see the article about Digestive Enzymes for more information about Enzyme Therapy. In the past, the therapeutic use of enzymes has largely focused on the use of digestive enzymes; these aid digestion of food but also mop up and dissolve dead material such as proteins and fats that accumulate in the tissues, organs, arteries and all blood vessels in the body. Research has shown that by combining a range of enzymes, with different actions, we can achieve greater, longer lasting, health benefits associated with the use of enzymes (as listed below). To this end we have formulated Multiple Enzyme Protect. Protease is responsible for digesting proteins in your food. Proteins are probably one of the most difficult substances to metabolize. Because of this, protease is considered to be the most important plant based digestive enzyme that we have. If the digestive process is incomplete, undigested protein can wind up in your circulatory system. When you take protease in higher quantities, it can also help to clean up your body by removing the unwanted protein from your circulatory system and all other tissues and organs of the body. Lipase is responsible for digesting fats in food. When taken in higher quantities it will also find its way into the blood stream and help to remove excess fatty deposits from the inside of your veins and arteries. When this occurs, the arteries and veins are more open and allow the blood to flow more smoothly throughout your body. It is well understood that clogged arteries cause a rise in blood pressure, and that this in turn leads to heart problems. Using extra lipase during the pre-digestive phase can help with overall fat control both in the stomach and in the arteries of your body. Additional lipase can also be helpful in a weight management program, because it converts fat to energy instead of allowing it to be stored in your body. Amylase is the second most important plant based digestive enzyme that we have. Amylase is responsible for digesting carbohydrates in food. Because of this, it could be considered a natural antihistamine. Incomplete digestion of carbohydrates has been linked to blood sugar imbalances, allergies, and asthma. Amylase is also very effective in helping to relieve the symptoms of allergic reactions to such things as insect bites, pollen irritation, or contact with poison oak, poison ivy, or sumac. A possible reason why some people appear to be more immune to these poisons is because of a higher amount of amylase within their bodies. Cellulase is responsible for breaking down fibre. It is also an excellent antioxidant because it binds to heavy metals and other toxins and carries them out of your body. Lactase is responsible for digesting the milk sugar found in dairy products. Supplementing the diet with Lactase Enzyme makes milk products more readily digestible, helping to relieve discomfort caused by lactose intolerance. Pectinase breaks down carbohydrates such as pectin (found in many plants); Pectinases are produced during the natural ripening process of some fruits to soften cell walls. Malt Diastase hydrolyzes amylose and other polysaccharides, studies have shown it is useful for digestive support and general nutritional support, also breaks down unused glycogen in muscle tissue. The Other IngredientsTo ensure a balanced formula, Seagreens, Rosehip, Hawthorn, Sodium Ascorbate and Alpha Lipoic Acid are added to increase the body's ability to make maximum use of the enzymes. The Vitamin C and bioflavonoids act as anti-oxidants and to help to strengthen the collagen of the blood vessels, this is important as Multi Enzyme Protect will clear out debris from the blood vessels. Vitamin C deficiency as well as silica deficiency renders the blood vessels weak, and liable to haemorrhage or rupture, especially as we age, so we need to protect them with these nutrients. Please note that we consider Organic Silicon as a complementary product to Multi Enzyme Protect. MORE IS BETTER AND A LOT MORE IS A LOT BETTER! The higher the activity level of the ingredients the better the product. Unlike most other nutritional ingredients that are measured by weight, the correct labelling for enzymes is in activity units. It has been discovered in many clinical studies and on a personal experience basis by many individuals and therapists, that taking enzymes can often reduce or even eliminate the very diseases that have developed over years of cooked food consumption. In this situation, enzymes should be taken with food to help the digestion of that meal and also on an empty stomach / in-between meals to retain their potency, enter the blood stream and to be delivered around the body to gradually break down the toxic waste that has built up from years of enzyme insufficiency. Take 4 to 9 capsules daily. (from 2 capsules twice daily up to 3 capsules three times daily in times of extra need). To obtain the full therapeutic benefits take on an empty stomach (for example, upon rising and retiring and / or at least 1 hour before and 3 hours after food). If nausea is experienced when taking on an empty stomach, take with food until adapted. By taking with food, the therapeutic efficacy of Nattokinase and Serrapeptase will be minimised. If nausea continues, then it may be necessary to take Serrapeptase on its own on an empty stomach which will not cause any nausea, and either Multi Enzyme Protect or Digestive Enzymes with food. People with serious or stubborn health concerns should take Multi Enzyme Protect at least three times daily on an empty stomach. If over 40 years old it becomes increasingly important, if eating cooked food, to take enzymes with the meal, as our natural enzyme production reduces with age. 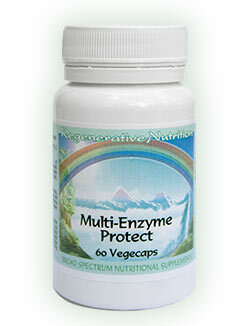 Multi-Enzyme Protect is a high potency supplement which boosts vitality and will cause detoxification. Many people, especially if sensitive, will need to start at a low dose and gradually increase as adaptation occurs.